Austin Fairchild Management Company, LLC, and Weal Development, LLC, are real estate investment, development, and management companies dedicated to planning and execution in real estate investments. AFM is grounded on a firm foundation of sound operations and excellent property management. Weal Development renovates and invigorates buildings and communities. We specialize in property value creation through repurposing, renovation and rehabilitation of land and buildings. Our focus and efforts are built on a firm foundation of planning and execution. Just as we ensure structural integrity in our properties, we demand the highest level of business ethics. We push ourselves to innovate by combining depth of experience and expertise with new ideas and new ways to add value to our projects for our customers and partners. At every level we work to understand the needs of all and create the best solutions—from choosing the design team and general contractor to developing customized reporting for our financial partners. Just as we constantly endeavor to improve properties, we always work to improve our business relationships, building on long term associations, contacts, and networks. We engage customized teams of consultants who offer the best background and ability for each project. 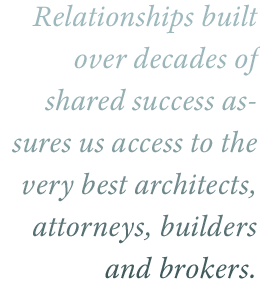 Choosing from longstanding relationships we are able to engage the best architects and attorneys, builders and brokers for each specific need and opportunity. We are able to outsource while retaining tight control over the project and property management, financial records and reporting. Opportunities to create value are optimized at each stage of the real estate production processs. When we develop raw land, we bring in zoning and entitlements, utilities, and users to create a rich picture of possibilities. We renovate and repurpose older structures with the same eye for innovation. Through horizontal and vertical construction and rehabilitation, opportunities are realized at every stage of the process. Our long-term associations and networks, including brokers, government officials and planners, yield added value at every level.